This smoothie has become my signature quick go-to breakfast over the years. I’m surprised I haven’t blogged it already! It takes less than five minutes to whip up and it can be tailored to include your favourite fruits. The base is made with banana, orange juice and yogurt. You could just leave it like that or throw in a handful of chopped mango, strawberries, blueberries, blackberries, whatever you fancy. Add linseeds or chia seeds for a little extra fibre if you want. In the photo above I threw in a spoonful of leftover Shetland-grown blackcurrant purée I’d made to drizzle over a pavlova recently. I started making this smoothie 15 years ago while I was pregnant with my eldest and I was trying to include more fruit into my diet. I’d won a Braun hand blender in a pregnancy magazine competition and do you know what – I used that blender today to whip up this smoothie! It’s still going strong! It’s made puréed baby food for all three of my children and thousands of these smoothies. There’s enough in this recipe to serve one, heartily, or to share with someone else. What do you like in your smoothies? A delicious quick breakfast smoothie that can be tailored to your liking. hanadful fresh fruit mango, strawberries, blueberries, etc. Place all the ingredients in your blender and pulse until well combined. Serve immediately. A great one. I was given a smoothie maker for Christmas so bring it on ! You can get packets of ground linseed in Lidl’s. I have Chia seeds too which I add to everything! Looks lovely and handy when you’re on the go! Great idea for a summer breakfast. wish i could be more creative when it came to things like this, this looks delicious. 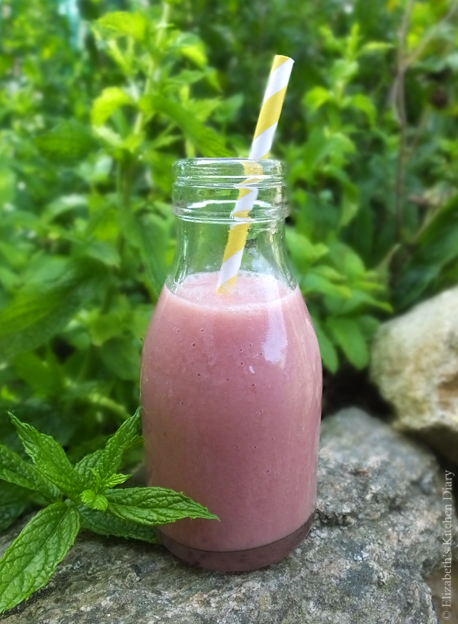 I love smoothies – especially when I have fresh raspberries or blackberries from the garden to put in. This morning mine was blackberry, banana, melon, redcurrants, blueberries, cacao, hemp seeds, chia seeds, and mango juice. They generally end up being whatever I have on hand. This sounds and looks great! I love a smoothie, especially during the Summer, when I wake up hot! There is nothing more refreshing than a cool smoothie to start the day! I am not big fan of smoothies and juices, I daresay and I had a look on your website bcs you have left a nice comment on my blog, where I typed my mussels recipe. I tried yours and I love it. Energizer. Also amazing website. I am not keen on Yogurt – any other substitute? This is how we make it, I’ve never really experimented much with non-dairy alternatives to be honest. You could always just omit it? The banana is the ingredient that makes it lovely and creamy. Not tried chia seeds, must give them a go, see what all the fuss is about. I’m fairly new to them myself (I said the same thing to myself – had to see what all the fuss was about!). I sprinkle them on my breakfast yogurt with fruit and on top of salads or in smoothies. Haven’t been more adventurous than that yet though. That bottle looks like the one’s we used to have milk in at school. I cannot buy smoothies as I cannot tolerate any citrus which all ready made ones seem to have in them. 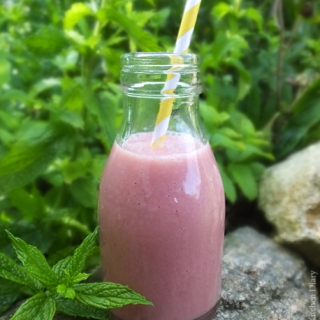 We made a delicious blackcurrant smoothie this week and I have made them with rhubarb too in the past. I picked up this little milk bottle near where you live in Grizedale (near the Go Ape place) 🙂 What do you use instead of citrus? That sounds like a pretty robust blender……. Well done Braun! Mental note made to ‘make more smoothies’! I forget how easy and quick they are…….. It really is a fantastic hand blender. I’ve never had any appliance last that long before! I love spinach in my smoothies at the moment. Green smoothies are delicious. But yours sounds healthy and tasty too. fabulous idea Elizabeth – and love the little milkbottle! Nazima recently posted…Bibimbap and Beef Bulgogi. A laid back family meal. Thanks Nazima 🙂 I picked that little bottle up in the Lake District – I fell in love with it! I think I need to be having a smoothie for breakfast more often. I am so boring and just eat cereal but I e=really must get smoothing in the morning as when i do have them, I find I am full for so much longer. Especially with added oats or chia seeds. Love the thought of adding blackcurrant puree, so packed full of vitamins! I’m not a cereal person, myself. My kids are, but I prefer something a bit fruitier (after several coffees of course!). The blackcurrant purée was all I had on hand at the time! Frozen fruits work well too. I posted an apricot melba smoothie today, but it was green smoothies I took to work. Trying to ward of this chest infection. I am totally addicted to them. It’s a nice way of getting extra fruit and veg into Cooper too. My kids love green juices, but I don’t have a machine strong enough to make a green smoothie. I’d love one of those Vitamix machines! Very tasty! We love smoothies here…..I just throw in whatever fruit I have and it always seems to work! !